Many a truth is said in jest, but senior citizens deserve what? The above may sound funny, but it contains a great deal of truth. Simply because I am over age 65 I have received discounts virtually every place I have been in the last month. Why? Granted there are many seniors living very frugally, but if you are a senior playing golf or touring any number of attractions, you are probably not one of them. What this all reflects is a mindset, a mindset that drives government policy. One thing to consider is that income in retirement does not necessarily equate to wealth. Also, if you have no debt and live modestly in a lower cost area you can live quite well on what others will conclude is living paycheck to paycheck. But the larger issue is stated in the sign. You have from age eighteen or perhaps 22 or 23 to plan for retirement. Life choices along the way will largely determine your stutus in retirement years. If you have, for whatever reason, been low income all your life, that will get worse in retirement. If you have been middle class all your life, that will get worse in retirement unless you have planned well and acted responsibly on those plans. If you have been upper income all your life, it will get worse in retirement and you have no excuse for not having adequate resources when you get there. If you have been wealthy all your life, you are on your own as well as expected to chip in extra for everyone else. In any case, you had 40-50 years to see what’s coming. You had all those years to decide what to spend and what to save. Don’t discount now what it takes to have a secure retirement in forty-years. Saving for retirement and paying for health care have one thing in common. They both come at the bottom of the list of spending priorities for many, if not most, Americans. That is something policy makers should understand. rd, what discounts are you talking about from the government? I do not think I am getting any. Discount on buses, etc, national parks, some golf courses and admissions to government historical sights (some federal, some state and also some local). Not much of a discount, because I do not use any of these. I did go to Mount Rushmore in 2015, no discounts. I went to all the national parks when I was younger, traveling across the USA in my 20’s thru 40’s. No need to go again in my 60’s. I tried golfing, hated it, mini-golf is more my style. The grandkids love it. If you are a senior you can buy a pass for national parks. It’s good for life and gets you and two other people in a park or you and whomever is in your car in any park for free for life. We have been using one for fifteen years or more. It paid for itself after one visit. I like my retired military ID, I have used it a few time since 1995 with friends and we were waved into the Glacier and Yellowstone parks, no charge at all. I get better military discounts from businesses than senior discounts in areas that have military bases. What was a marketing gimmick to get seniors out of their houses off hours to fill restaurants and hotels has turned into an entitlement. It is in fact the first thing we ask about when making plans for a trip. I ask for a discount for AAA, AARP, NRA, etc.. Otherwise I feel like I am getting ripped off by at least 10%. How about if everybody just lowers their prices by 10% and offer no discounts and be fair to young families too. Lower prices for seniors or for any other group are purely business decisions made by the owners of the business. No one is forced to give discounts. These discounts are believed by business owners to be incentives to groups which will bring him increased business. Business owners recognize that the discounts will reduce their profit margin but make the calculation that overall profits will increase. There are many businesses that use this model. Bars that offer free or half price drinks to ladies hope to attract more gents which will increase their overall business. Parts suppliers offer discounts to tradesmen to attract their business which they assume will help their bottom line. 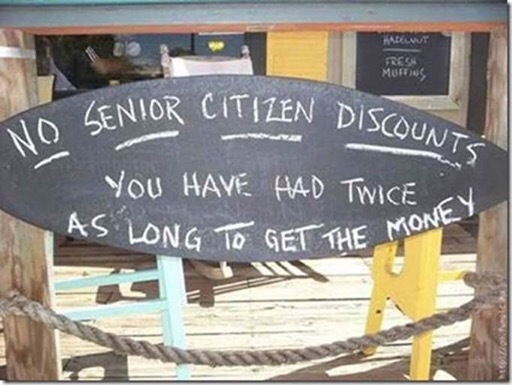 Obviously, the business owner pictured above made the decision that incentivizing a senior citizen with discounts was not in his own self-interest. What about governments giving such discounts? Not sure what you mean by government discounts. Governments are not businesses in the sense of a for profit endeavor.